Okay, so it’s not only the missing ‘h’ that separates the Cardinal’s Jon Jay from former American supreme court justice John Jay – those 200 years are quite the chasm. But the Cardinals’ version of Jay is taking on a new role, after Ryan Ludwick was traded to the Padres over the weekend. But is he a legitimate fantasy starter in the outfield? At first blush, everything seems to rule in favor of Jay’s ability to stick. Looking at the Bloomberg Sports Fantasy Tools spider graphs, he looks like he has power, and the strong batting average helps. A .366/.415/.553 batting line should play on any fantasy team. Even a summary check of his minor league numbers this year (.321/.394/.491) would pass inspection. It’s a heckuva fast start. A longer look, though, takes some the shine off Jay’s profile. Jay’s batting average on balls in play is an astronomical .424; even the two biggest outliers last year, David Wright and Ichiro Suzuki, had .394 and .384 numbers in 2009. Also, BABIP stabilizes at .300 around baseball every year. 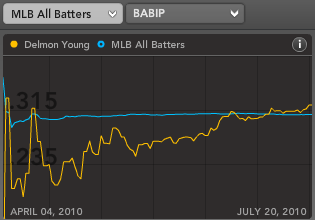 So you’ll see Jay’s BABIP, and batting average, come down significantly as natural regression sets in. Then there’s the minor league record that deserves further review. Minor League Splits.com has a translator that creates major league equivalents for minor league numbers. That translation says Jay’s Triple-A numbers in 2010 would work out to .276/.335/.406 in the big leagues. Useful, but hardly as exciting as the stats he’s putting up currently. only 439 plate appearances, so it’s not definitive, but it exists. Though it may be an issue, the Cardinals did start Jay against lefty Zach Duke over the weekend. Then again, there is a threat coming from Allen Craig as well, who actually sports better numbers against lefties (.900 career OPS versus lefties in the minor leagues) and has his own solid batting line down on the farm (.307/.369/.511). Craig has shown more power in the minor leagues and is a threat to Jay’s playing time, as the justice’s batted ball luck evens out. Zoom out on the minor league numbers for Jay, and you’ll notice an inconsistent slugging percentage. Just last year, Jay had a .281/.338/.394 batting line with the same Memphis team, numbers which didn’t result in any sort of major league callup. That’s right, Jay was repeating Triple-A this year, which takes his stats down another notch. After three years of college before his pro career, Jay has always been around average age in his leagues, and at both Double-A and Triple-A, he struggled at first before recovering on his second try. Obviously, Jay is not struggling with his first shot in the major leagues. But you can also see in the numbers that his power is inconsistent, the speed is decent but not elite (he had a career high of 20 stolen bases in Triple-A in 2009), and there is a threat to his playing time on his team. Even as a batting-average specialist, there may or may not be struggles against lefties in his future, and there’s sure to be some BABIP pullback. The ruling of this court is that Jay is a fine pickup in deep NL-only leagues. But in shallower mixed leagues, there are probably better options out there on the waiver wire. For more on Jon Jay and other outfielders, check out Bloomberg Sports’ Fantasy Tools. League Championship Series. He was also named ALCS MVP. but a far cry from the lofty projections of a top overall pick. Flash-forward to present day, and the trade looks a bit more even. when the deal was made. 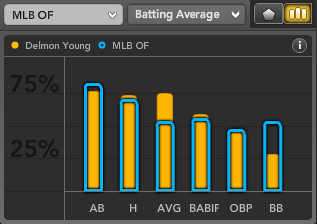 That said, Young’s plate discipline has room to improve. pitches — vs. 56.6% in years past. 22% of his base runners, tied for tops in the AL. According to ESPN.com, Delmon is still available in more than 5% of leagues. If you happen to be in one of those leagues, put in a claim immediately. If you are not fortunate enough to be in such a league, check in with Young’s owner. This breakout looks like it could be the real deal. For more on Delmon Young and 2010 breakouts, check out Bloomberg Sports’ fantasy kits. The similarity, though, was put on hiatus last season. Kemp increased his power to 26 HR, maintained his speed, and slightly boosted his batting average to .297. He became a consensus first-round pick for the potential to make big contributions in all five categories. Wow, how things have changed. 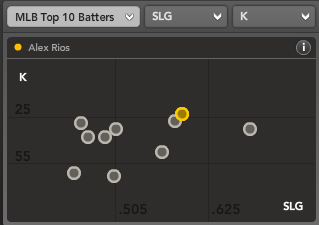 Right now, Rios is arguably the most valuable batter in fantasy leagues. He’s on a pace for an amazing 35 HRs and 50 SBs and he’s doing it with a .318 batting average. We can’t say that Rios is getting lucky either. His peripheral stats show some tremendous improvement from a year ago. Most noticeably, his strikeout rate is down to a meager 11.8%, which is about Albert Pujols‘ career rate. Rios’ walk rate is up too — from 5.8% to 7.9% — and his ISO (Isolated Power, which is slugging percentage minus batting average) is up from .148 to .272. Meanwhile, Kemp has been a slight disappointment. His power (11 HRs) is fine, but his average (.279) and speed (8 steals and 8 times caught stealing) are both unworthy of first-round pick status, especially as an outfielder. Kemp’s strikeout rate is up to 27% and there doesn’t seem to be anything below the surface that points to bad luck. He’s doing about what he should be doing. I made the case last September that we were expecting a bit too much from Kemp, writing that “with batting average regression and less speed, Kemp could easily fall back into Hunter Pence/Alex Rios/Corey Hart territory.” That seems to have been on target, at least so far. No doubt, Kemp is a worthy player, and there aren’t too many 25/25 candidates in baseball. But what we saw this spring in fantasy drafts across the land was a bit of an overreaction to recent trends. Clearly, today, there’s less separation between Matt Kemp and Alex Rios than once imagined. Both show power and speed. Perhaps Rios now gets slightly more credit for being able to make contact at a higher rate. Kemp is a great young player and there’s no reason for any of his owners to sell him low right now. As for Rios, I think he deserves once again to be mentioned in the same breath. If an owner in your league thinks Rios is anything less than a Kemp quality talent, I’d say buy. The analogy between the two players is off hiatus. 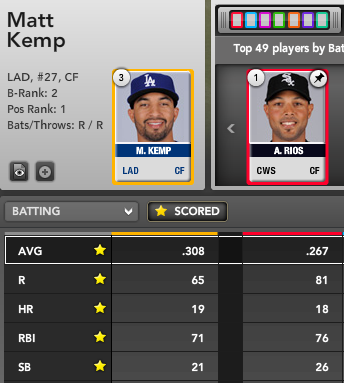 For more on Matt Kemp, Alex Rios, and other power-speed candidates, check out Bloomberg Sports’ Fantasy tools. The Boston Red Sox’ attempt at improved run prevention has been put on hold temporarily – at least in the outfield. On Tuesday, the team placed outfielders Mike Cameron and Jacoby Ellsbury on the disabled list. Cameron suffered an abdominal tear, while Ellsbury has been slow to recover from bruised ribs. The Ellsbury move is retroactive to April 12, meaning he will be eligible to come back next Tuesday. In the interim, Josh Reddick and Darnell McDonald were called up from Triple-A Pawtucket. McDonald is a 31-year-old journeyman who got off to a hot start in the minors, and has continued that in his first two games with Boston. However, he holds little fantasy value unless you’re in an extremely deep AL-only league. Meanwhile, Reddick might be worth a look in slightly shallower leagues. He spent 27 games with the big club in 2009 after hitting .277/.352/.520 at Double-A. The 23-year-old outfielder is rated above average defensively by Total Zone, a metric similar to Ultimate Zone Rating. He has shown good pop – posting an ISO (Isolated Power, which is slugging percentage minus batting average) of .242 at the Double-A level in 2009. With Bill Hall‘s recent struggles at the plate and in the field, Reddick is likely to see the bulk of playing time in center. The other player to pick up in this outfield shuffle is Jeremy Hermida. A quiet off-season acquisition of Theo Epstein, Hermida’s potential became too expensive for the thrifty Florida Marlins. This made him a prime target for Epstein, who paid pennies on the dollar for his talent. For now, Hermida will in the Sox lineup on most days until Cameron and Ellsbury are both healed. Even after that, Hermida could steal some at-bats from the struggling David Ortiz. Hermida, 26, had his best season in 2007 while playing for the Marlins. In that ’07 season, he hit .296/.369/.502 with 18 home runs and 63 RBI in 123 games. Since then Hermida has been on a downward spiral. His ISO has dropped in each of the past few seasons – down from .205 in 2007 to .133 in 2009. Small sample size rules apply, but Hermida’s left-handed swing has enjoyed life so far in the American League. On the young season, he has six extra-base hits including three home runs. Defensively, Hermida has made Jason Bay look like Carl Crawford, but has had less than 80 innings to learn the nuances of playing the outfield in Fenway Park. Hermida should be available in most leagues and is worth a look in deeper mixed, as well as AL-only, formats. Once more, he is the stronger play over Reddick (or McDonald), who could be back in Pawtucket in a week’s time. If Hermida swings a hot stick as a fill-in, the locals will be calling for him to get more at-bats over Big Papi in no time. For more on the hottest fantasy baseball topics and trends, check out Bloomberg Sports’ fantasy kits. The next two episodes of Bloomberg Sports’ fantasy baseball podcast are now live. In Episode 3, Mark Berniker, Wayne Parillo and I tackle top pitchers and mid-round values. In Episode 4, we tackle the outfield crop beyond the first round of the draft. For more fantasy baseball player rankings and draft tips, check out Bloomberg Sports’ fantasy kit.